Aernie examines the prophetic material in the Old Testament and its relationship with the prophetic material in Second Temple Judaism, Hellenism, and the early Christian movement. The subsequent analysis of 1 Corinthians constitutes an investigation of the effect of the Old Testament prophetic tradition on Paul's self-presentation in 1 Cor 9.15-18, and the rhetorical framework in 1 Cor 14.20-25 as a methodological foundation for the exegetical analysis of 2 Corinthians. 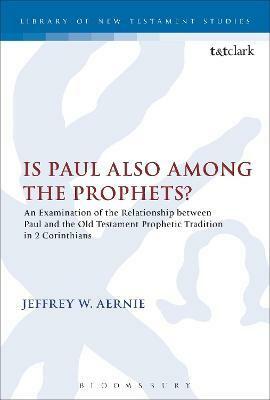 Aernie explores the influence of the Old Testament prophetic tradition on Paul's apostolic self-presentation and rhetoric in 2 Corinthians. The analysis of Paul's self-presentation examines the apostle's relationship with Moses, the Isaianic servant, and Jeremiah in order to define Paul's position with regard to the preceding prophetic tradition. Aernie analyses Paul's argument in 2 Cor 2.14-16; 4.1-6; 6.14-7.1; 12.1-10, and then seeks to examine the influence of the Old Testament prophetic tradition on the formation of Paul's rhetorical framework. Aernie's intention is to provide support for the notion that the particularly prophetic nature of Paul's apostolic persona affects both his self-presentation and rhetorical agenda in 2 Corinthians. Jeffrey W. Aernie has received his PhD from the University of Aberdeen, UK and is Lecturer in New Testament at United Theological College (School of Theology, Charles Sturt University) in North Parramatta, Australia.